Once upon a time, it was all the rage to adorn oneself with beauty patches – little material creations stuck onto the skin to emphasise the whiteness of the complexion and to conceal blemishes. Here’s a look at the patching rage and what the little spots came to signify. A number of beauty spots covered her superb forehead. A Roman lawyer, Regulus, apparently wore a patch on the right of his forehead when pleading for the defendant, and on the left when working for the plaintiff. 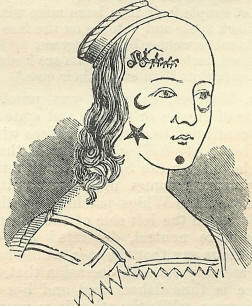 In the 16th century, beauty patches were seen again, most likely to cover up skin blemishes. The use of harmful lead-based cosmetics, as well as diseases like smallpox, left people with damaged skin, scars and pock-marks. Patches were a convenient way to cover up such things. But it was during the 17th century that patches really took on and became a fashion statement, in particular for the upper classes, and were worn by men and women alike. In France, the use of patches increased dramatically under Louis XIV (1638-1715) and continued into Louis XV’s reign. French nobility had a fondness for lily white skin and white-coloured wigs, and to emphasise someone’s place in society, white face paint, rouged cheeks and the wearing of patches was the done thing. 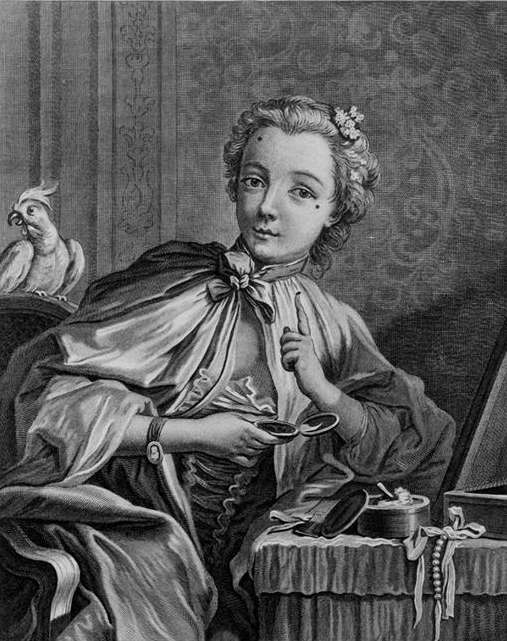 The influence of the French court on makeup fashion was seen across Europe, and patching was popular throughout the 18th century. Patching finally fell out of fashion in the late 1700s, particularly as more subtle or natural makeup become the favoured look. While patches had not completely disappeared, their presence was no longer commonplace. Beauty patches had a short-lived revival in the late 1940s, where boxes of manufactured patches in a variety of shapes could be bought. The French called beauty patches mouches meaning “flies”. A pedlar selling fashion accessories, including beauty patches. As with many fashion trends, beauty patches did not go without scorn, satire and even outright banning. 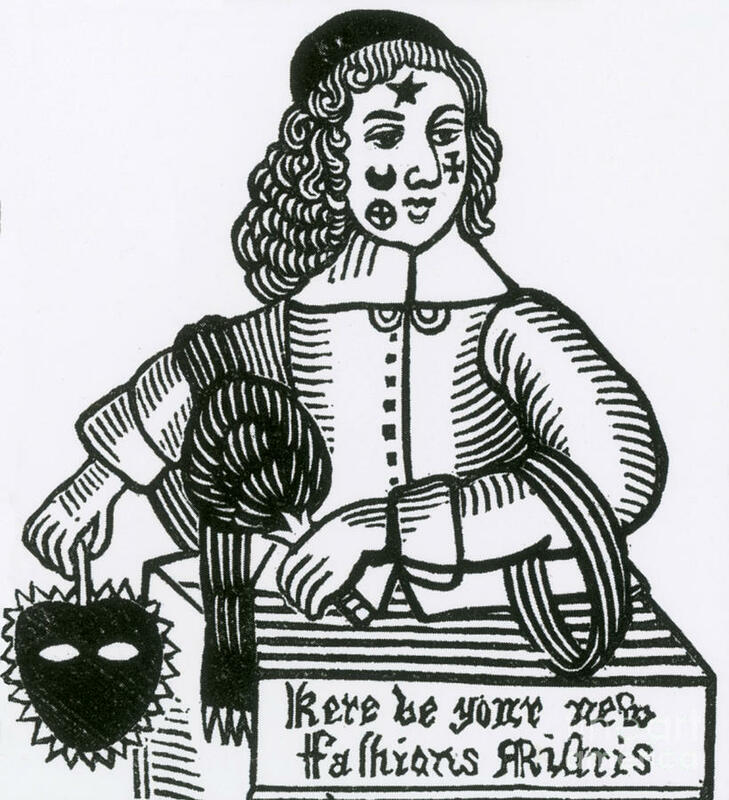 The amount of patches worn by some did not go unnoticed by those who opposed the fashion, and was often commented upon in poems, plays and publications such as The Spectator. English clergymen were often opposed to patching (with others having been noted as wearing them!) and some in society felt this vanity, along with the painting of one’s face, was the root of all evil, leading to things like prostitution or plague. Patch fans no doubt simply ignored all such naysayers. Oliver Cromwell was a spoilsport in general and disapproved of many things – and patching didn’t go unnoticed. He managed to ban the practice, if only for a short time, in England in the mid-1600s, using the power of the government. After the Restoration in 1660, patching resumed and flourished. The region of Zwickau in Germany prohibited patches by law in 1705. Woodcut of a well-patched lady (English, c.1650). Patches came in a variety of shapes, from the understated spot to stars, crescents, diamonds and hearts. Even more elaborate designs could be had, featuring animals, insects and figures. A coach and horses design, as well as a tree complete with birds have also been seen! The most popular colour was black, as this emphasised the whiteness of the skin the most, but patches could also be made in other colours to match a lady’s attire or her eyes. The common materials used were taffeta, velvet and silk. Paper could also be used and poor people may have used mouse skin to create their patches. Whatever the material, mastic was used to adhere patches to the skin. Patches could be homemade, or purchased from pedlars, who would advertise their wears by not only wearing the patches, but with catchy rhymes. 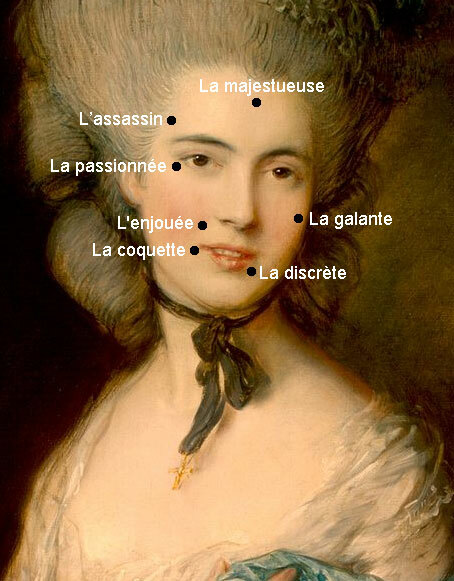 Using Thomas Gainsborough’s Lady in Blue (c.1790) to illustrate the meaning in placement of mouches. A patch used to cover blemishes was la voleuse (“thief”), but also known as “the concealing”. Other messages that patches could convey included someone’s marital status e.g. an engaged woman wore a heart patch on the left cheek, indicating she was not available; once married, she transferred the patch to the right. In England, patches took on a political meaning: female supporters of Whigs wore patches on the right side of their forehead, while supporters of Tories wore patches on the left side. We wonder whether the misplacement of a patch resulted in an erroneous message! The fashionable would keep their patches in a patch box – a small rectangular, oval or round lidded box, often decorated with a hand-painted design. They were similar to snuff boxes, which could also be used. Portable patch boxes were slimmer than the ones made for the dressing table to make it easily carried, allowing someone to replace patches or slap on more as needed. Boxes were made from various materials including tin, gold or silver, they had a hinged lid often with a mirror inside. Patch boxes for the dressing table could also be made from carved wood, porcelain or enamel. So, that’s a look at the beauty patch – all the rage for a good hundred years or so for the upper classes across Europe.